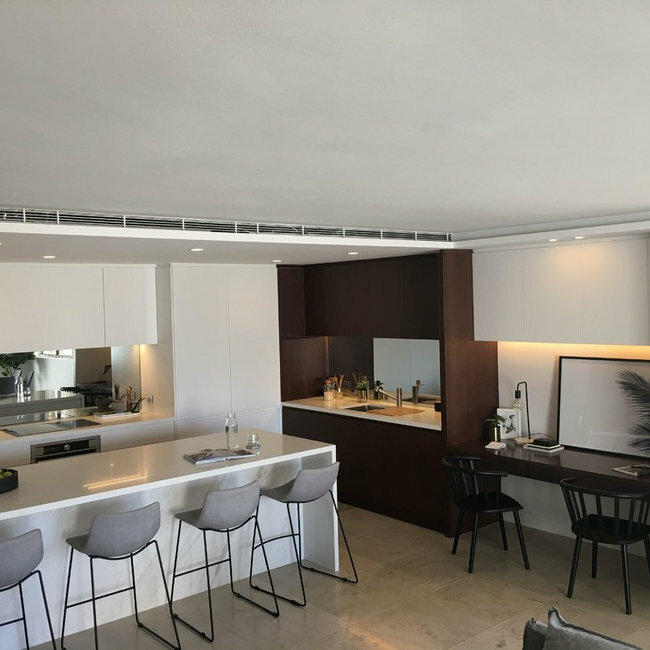 A wonderful kitchen conveniently located by the beach-side, featuring an open concept kitchen, and varied storage system using pull out drawers and wall mounted benches. 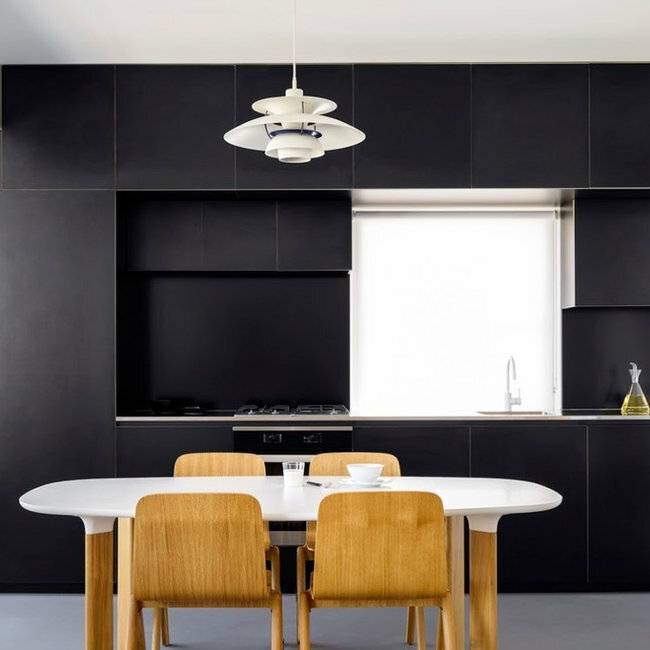 The kitchen features a stark contrast of white and black with a complementary shade of brown on the chairs, lighting and island frame. The storage consists of finger pulling drawers and cabinets, all of which are finished with a matte finish of polyurethane. 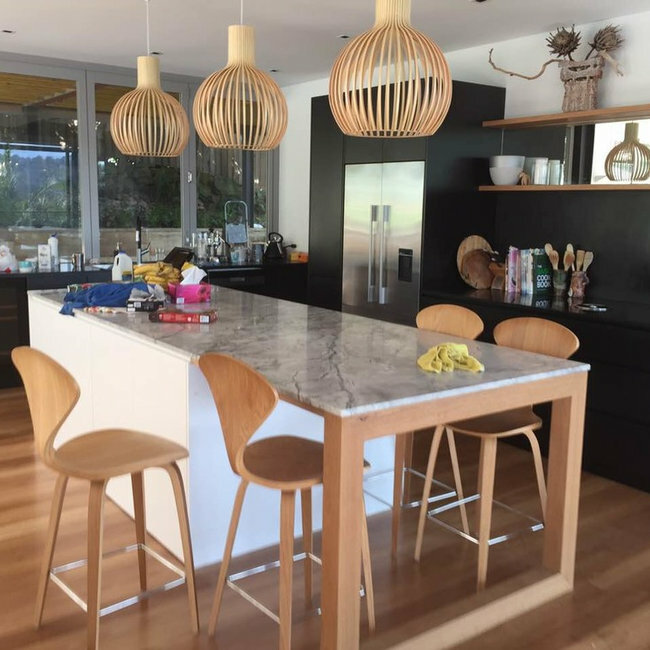 The island is topped with textured marble stone and equipped with a nice set of dining chairs which work well with the custom designed pendant lights. The kitchen also contains an oven and fridge which is integrated into the cupboards and placed in convenient areas which are easily accessible and practical. This designer apartment situated in Balgowlah features practical components like a large entertainment unit, open concept kitchen and study area. The kitchen is well ventilated and uses an ergonomic layout, placed conveniently besides the study area and entertainment area. The television is hidden behind exquisite sliding screen doors made from MDF, and a veneer finish (same as the cabinet doors). This design is not only visually appealing, but fairly practical as it keeps the entertainment quarters well-hidden and seamless along the edges of the wall. The apartment is contemporary and luxurious equipped with a hallway made from Persian walnut leading into a simplistic bedroom. The bedroom is also decked with Persian walnut along its back wall which is furnished with a monochromatic image to create visual interest. This bedroom in Balgowlah uses a durable Persian walnut for the bedhead and corner drawer. The room is simplistic but quite effective in terms of visual appeal because of the prominent symmetry within the bedside. 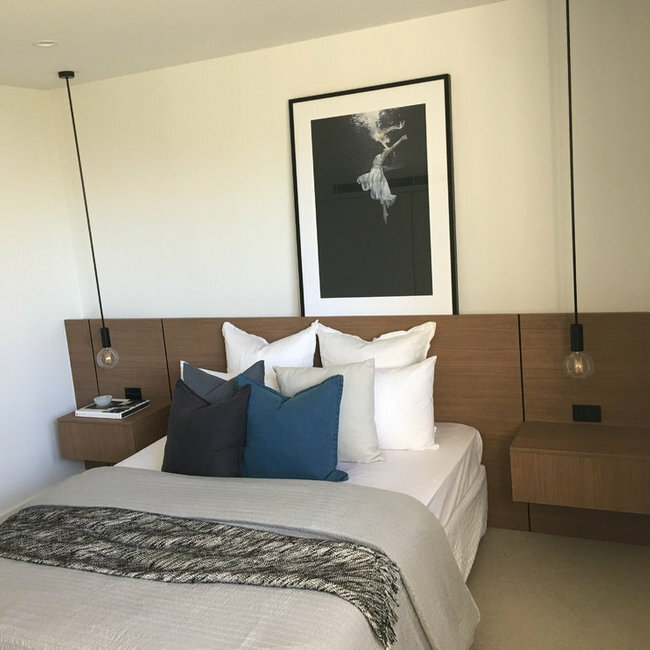 The bedside features two wall-mounted tables and long, hanging pendant lights which correspond with the black monochromatic picture frame. The drawer operates using finger-pulls and is multi-layered for easy organisation. A beautiful, contemporary inbuilt wardrobe in the peaceful province of Mosman. It is constructed of some fine American oak wood which is overlaid with a nice coating of white wash for a clean and refined look. The wardrobe is spacious and capable of storing a large assortment of clothing, and fits well with the surrounding area. It also features a simplistic ingrained pattern which continues across the wall for a seamless transition. 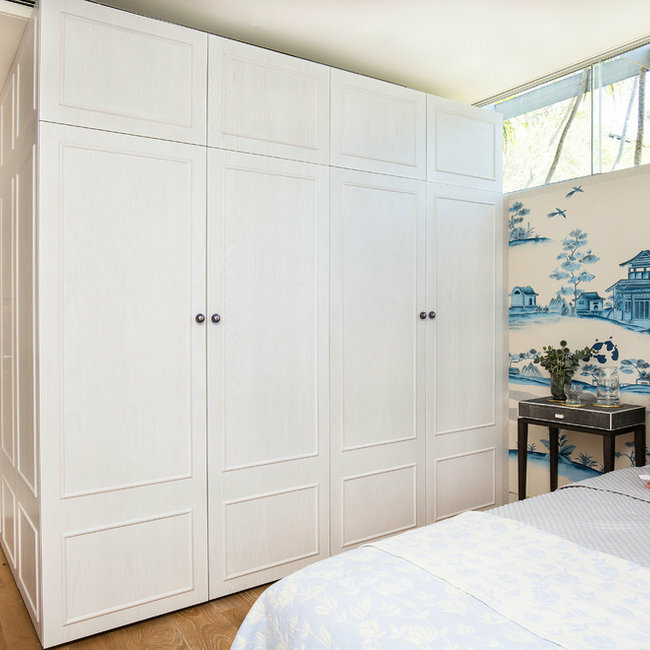 The wardrobe is complimented with a custom floral pattern as the design on its handles as a finishing touch, it is scaled proportionately for optimal visual appeal. Cool, calm and sophisticated, a pleasant open-concept kitchen which embraces the luxurious lifestyle in the North. Enjoy a contemporary, simplistic design that is easy-to-maintain and crisp within the tranquil vicinity of Lane Cove West. Featuring black high gloss polyurethane on its cabinetry and a glacier white bench top and splashback, it incorporates a stark contrast to create a theatrical setting. 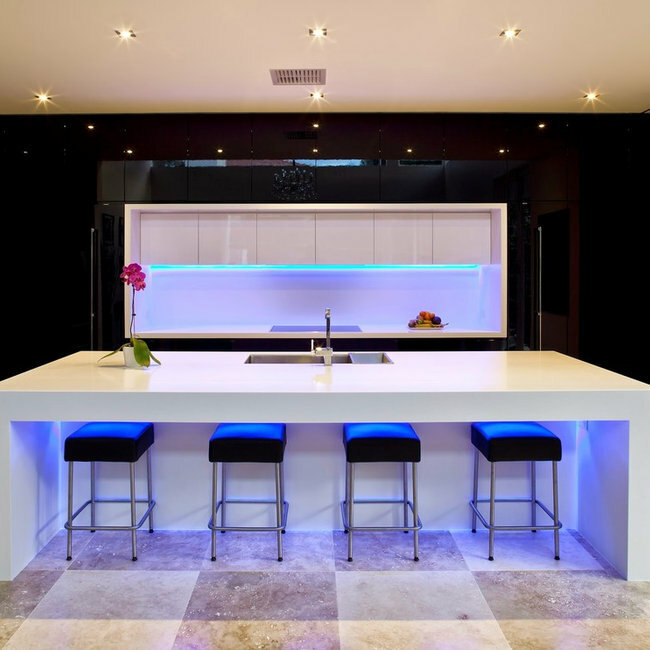 The kitchen splash back constructed of Corian White stone works well with fluorescent blue lights, which is also installed beneath the bench top. 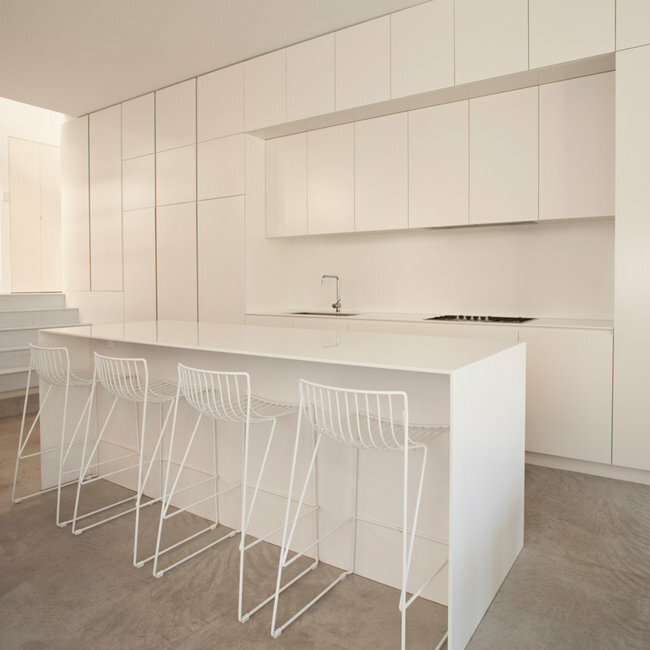 This monochromatic and modernistic kitchen design located in the Bondi Beach province, demonstrates the beauty of an "All-white" design. Mistakenly bland, it can be well and easily accented with condiments and complementary flowers or a bowl of fruits. It features a sleek, glossy design and an integrated push door catch mechanism across its cabinetry and cupboards as a seamless and flush implementation. 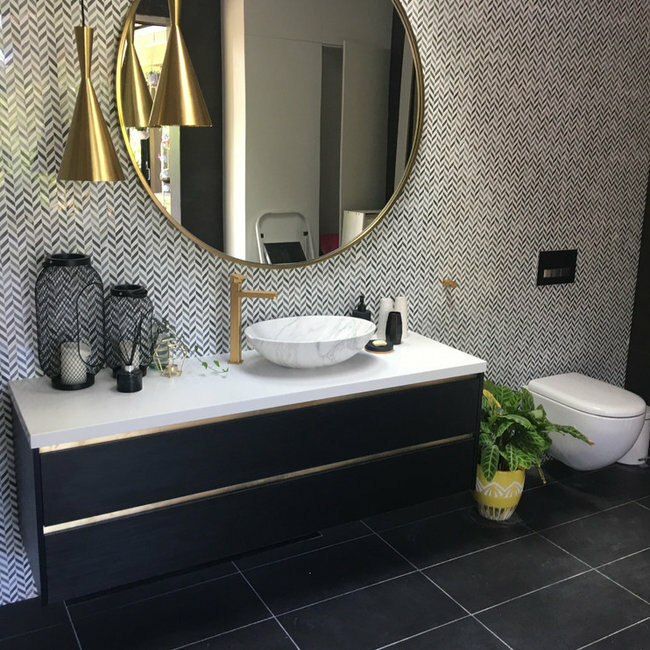 There is a stark contrast between the tiling and the kitchen which is intended to avoid it create a distinction between the floor and bench top as well as visual interest. The kitchen bench is spacious with a set of stove tops and the sink integrated into the counter top for compact and simplistic purposes. This remarkable kitchen transformation is one of many we have done at an affordable price. We implemented a contemporary feel, whilst maintaining the old ergonomic layout of the previous design. 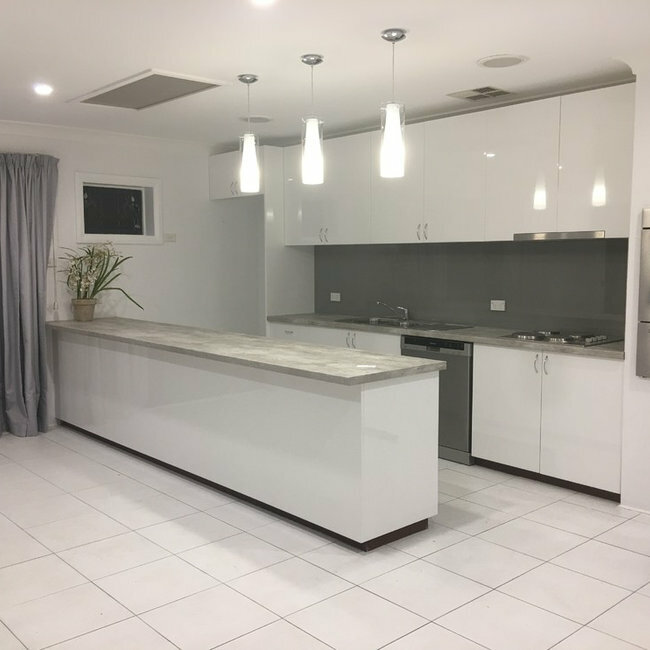 We moved towards a cool colour scheme to match the curtains, working with Lexicon white glossy doors for the cabinetry and a high-gloss gray splashback for additional contrast. The old stoves and ovens were replaced with newer high-performance ones and the space for storage was also increased drastically for convenience. As for the lights, we incorporated hanging ones as they would be ideal to provide sufficient lighting, and also reflect off the sleek surfaces. 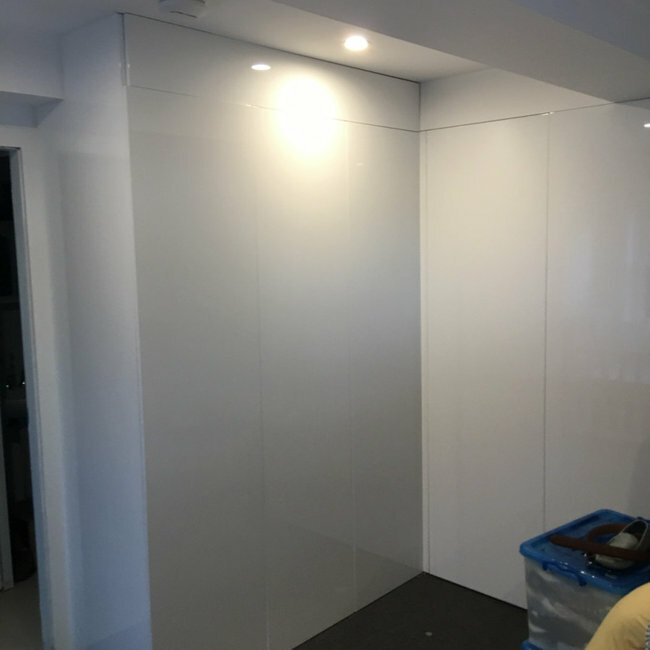 This is a minimalist inbuilt wardrobe design which we constructed according to the wall indent for a seamless transition. It features a sleek design, and glossy surfaces which we construed to be fitting for the integrated mechanism. We used hinged doors and an implemented push door catch system for simplicity and a clean-cut design. It is a low fuss wardrobe for an affordable price, and without handles it can maintain completely flush with the wall whilst providing a vast amount of storage space. This simplistic and contemporary design, yields intricate delicacies along its joinery and the wood grains. It features a fine and compact table, constructed of American Oak timber and topped with concrete credenza. 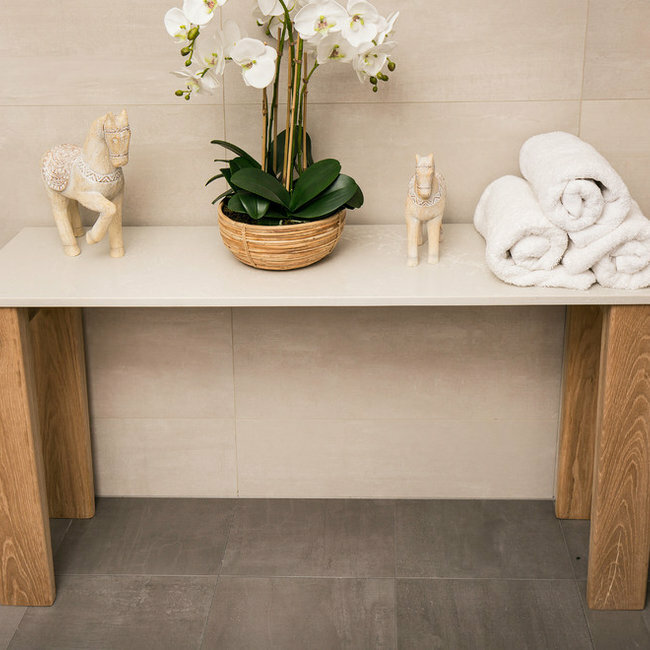 The concrete is crisp and a pleasing white colour, able to be integrated exquisitely into several bathroom designs. Overall, it is generally well-sized, in a manner that is not superfluous or overwhelming, but enough to store toiletries and bathroom necessities. 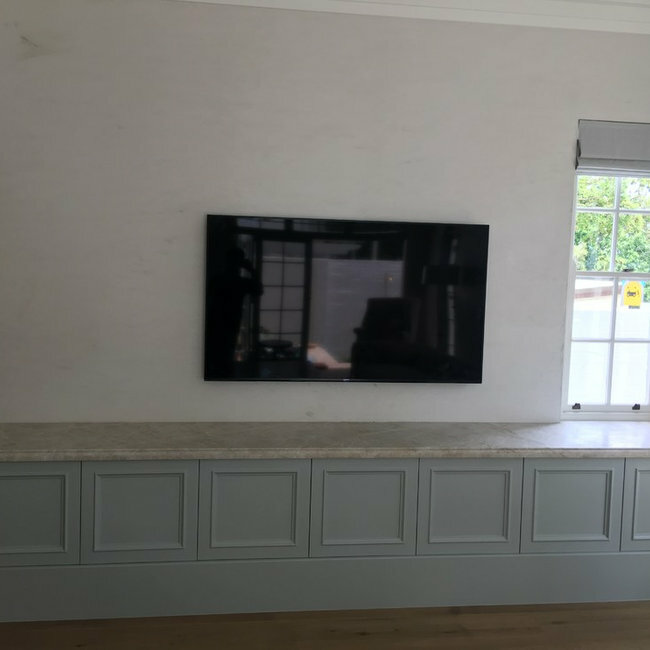 This project which took place in Darling point underwent the incorporation of a credenza to suit a tv unit. We matched the colour of the shaker doors to suit the cool atmosphere of the house. The credenza is broad and equipped with the ability to store various things because of its spacious interior. The design used square panels as it complements the round edges of the credenza which is intended to make it look integrated into the wall. We also justified its placement and sizing according to the height of the window sill to refine the instilled effect.